Instead of offering a new blog of our own, today we’d like to share the words of someone else. The Locksmith Ledger International published an article in their October 2012 issue on the rise of electronic locks being used in residential homes and the EMTouch lock. “Homeowners tired of rummaging in purses and pockets to find keys now have an attractive alternative” according to the Locksmith Ledger. It’s a pleasure to be recognized by a professional publication that reaches out to one of our valued customers – the locksmith community. White Bronze is a new material for Emtek, we released our first products this September. There was a great deal of excitement here when we were finally able to unveil our first White Bronze products to the world; it was the culmination of many months of hard work. While this material is new for us, we’ve worked with bronze itself for many years. It is only fitting that we have done so, because bronze has been used by humankind since 3,600 B.C. (Wikipedia.com) and played a significant role in our history, continuing into today. There’s an entire era named after the material, simply known as The Bronze Era. Google the term and you’ll discover how bronze was used in Mesopotamia, through ancient Egypt, Asia, Europe, and finally into the Americas. With the release of White Bronze, we’re feeling a little introspective about bronze, its rich history, and why it remains one of our most popular materials for door hardware today. At its inception, bronze allowed for the creation of tools, weapons, armor and more, that were sturdier than their stone or copper predecessors (Wikipedia.com). Roman soldiers fought their battles wielding bronze swords. Egyptian Pharaohs were paid homage with bronze statues and headpieces. Many of ancient Greece’s famous sculptures were cast in bronze. The history is rich and varied. But why do we continue to use it today for our door hardware? Two reasons: durability and beauty. For all the time that has past, bronze still holds up as one of the best materials for casting. Many techniques used in days of old are still in place today. We’ve found ways to be more energy efficient and create less waste, but the tried and true ways of shaping and polishing bronze hold steady. When we send out an Emtek door hardware set, the expectation is for that product to last our customer for many years to come. That’s why we have a limited lifetime warranty – things like bronze are built to last, but if something happens, just let us know and we’ll fix the problem. Bronze has a beauty to it that transcends design trends and endures the test of time. We have found ways to finish bronze that give it a look to fit any style. For example, look at a medium bronze finish and Emtek’s new white bronze material. They both fit into the bronze family; however, medium bronze has a dark, rich color while white bronze has a light and more polished look. It’s easy to find the right piece of hardware to fit your design style. However you use it, the timeless material of bronze can find a place in your home. 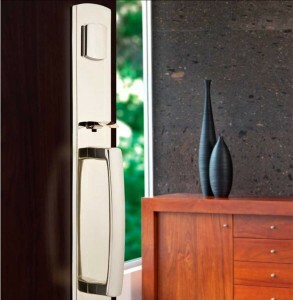 Emtek has been using it for over 30 years and will continue to create beautiful door hardware with it. Like the Romans, like the Egyptians, like so many before us and many who will follow us, we’ll create durable art with bronze. As Kermit the Frog once said, “It’s not easy being green,” however, while it is hard, being green is most definitely worth the effort. The word “green” is used everywhere today, from building homes with solar panels to recycling yogurt cups. Preservation of our environment and the ways to contribute to the effort take many forms. For Emtek, being green has meant making every effort to recycle the excess of any materials we use in the process of creating high quality door hardware and accessories. 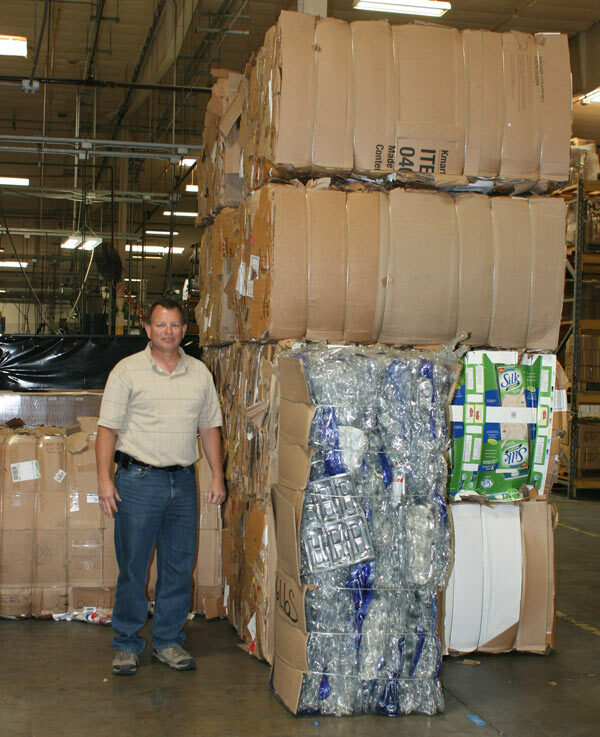 Beyond keeping hard materials out of landfills, Emtek has made changes that people across the world are making within their own homes, such as changing out standard florescent bulbs for more energy efficient lighting. Emtek was also able to reduce natural gas consumption by 30% by finding ways to run our manufacturing curing ovens more efficiently. Bit by bit, one step at a time, we each can make changes that can help and contribute to preserving the planet in which we live. Emtek is proud to be part of the effort. The rise of technology is everywhere today, even in the lock business. Electronic locks have been widely used in commercial properties for decades; however, more recent years have seen a surge in the demand for the residential version. Emtek has met this demand head on and is pushing the boundaries of design with its creation of a next generation technology, capacitive touchscreen. 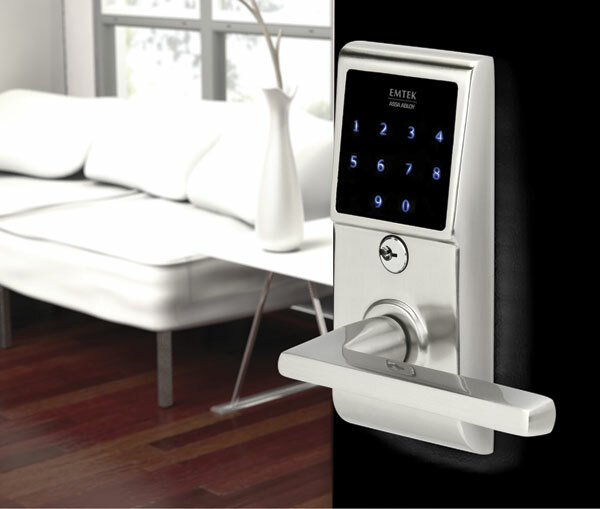 The EMtouch is an electronic lock that allows homeowners to unlock their door through the use of a programmed code, rather than the traditional key. The touchscreen has an interface familiar to anyone with a smartphone and is easy to use and program. Electronic locks are taking hold and are, more than likely, here to stay. Electronic locks have become popular to consumers tired of rummaging in purses and pockets to find keys and even battling the occasional lockout. The EMtouch can hold up to 20 codes, allowing the homeowner to assign codes to different people such as a guest or child. Picking a code that your child can easily remember, like a birthday, alleviates the worry of the child getting locked out and running to a neighbor for the spare key. The EMtouch interface offers a sleek touchscreen that is back-lit, making it highly visible at night. This high-tech screen also holds up to the wear and tear of everyday use. The screen is easy to clean, making it easy to wipe off any fingerprints and keep security at a maximum by removing evidence of which numbers are being pushed; a quick wipe and it’s done. The EMtouch is seamless with no openings in the lock for dirt to gather. Further, the EMTouch and all Emtek electronic locks have an aesthetic appropriate for residential homes. 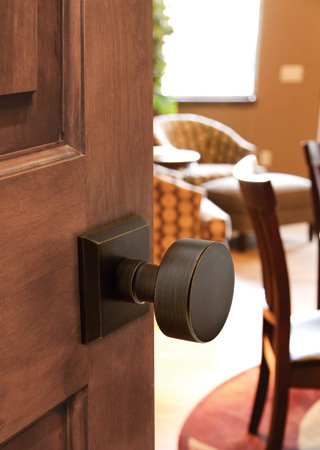 Unlike their more bulky commercial cousins, the Emtek electronic locks are smaller and look at home on the wooden door typical of a residential property. As a backup to technology, the EMtouch still has a traditional keyed cylinder which any locksmith can replace or rekey if needed. 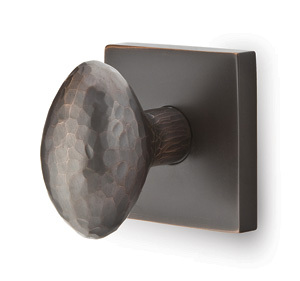 It can also be customized with nearly any lever from the Emtek collection, allowing you to create the look you desire. The Emtek Stuttgart lever offers a minimalist style for those preferring a contemporary look or a Triton lever could be used for a style with more curvature and flow. The EMtouch comes with printed installation instructions and two preprogrammed codes; further, Emtek has created a video demonstration, found on the company’s Youtube channel at www.youtube.com/user/emtekproducts. 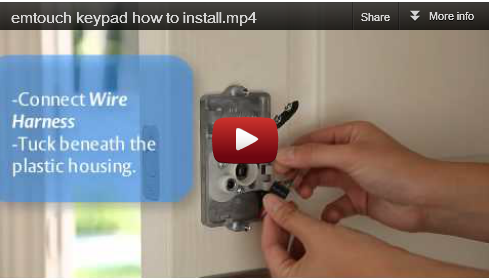 Learn how to install the EMTouch™ electronic deadbolt. THIS CONTEST IS NOW CLOSED – Stay Tuned for future contests with Emtek. 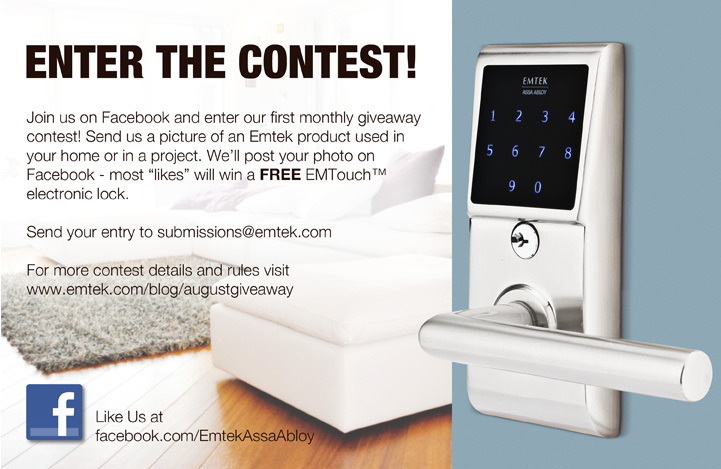 Enter the Emtek August Contest and win a FREE EMtouch™ electronic lock! Send your photo and project details to submissions@emtek.com. One entry per person please! Entries will be posted on Emtek’s Facebook page. Fans of Emtek will be asked to “Like” their favorite entry. The entry with the most “Likes” will be declared the winner, so have your friends “Like” Emtek and then “Like” your entry! Spread the word! You will win the ADEX award winning EMtouch electronic lock, voted “favorite lock” by the Whitecourt Press. Prize is non-transferable and no substitution or exchange will be made. For product details, visit here. Winner must respond by email no later than five days after notification of winning, or will forfeit the prize. You Say It’s Customizable, What Does That Mean? Have you heard that Emtek products are customizable? We hope so; our website has a new product selector, which allows you to mix and match passage and privacy knobs, levers, and rosettes. You can even see what your chosen pairing will look like in a variety of finishes. But is there more you can do with Emtek products? How can you design to your taste, exactly? In this post, we’d like to take you a little more behind the scenes and show you how Emtek works, the difference our process makes, and why it will matter to you. How do you buy door hardware? Do you go to store and take home what’s on the shelf? We have a different way of doing things at Emtek. Our products are found at hardware stores and dealer showrooms around the United States and Canada. We provide our dealers with beautiful displays that show the different styles of products we make, but here’s the thing….you don’t have to order anything the way you see it! Simply said, we don’t put the hardware together until you order it. Because we make every product to order, we have the freedom to make it just the way you want. 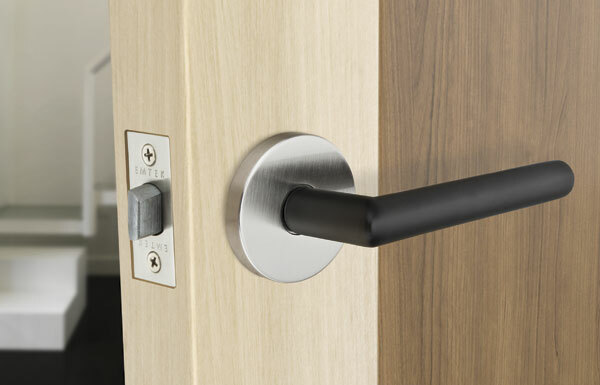 Do you want a lever on the outside of the door, but prefer an egg knob for the interior? Not a problem. How about a brass lever with a satin nickel rosette? Sure, we’ll get that ready for you! You may have some reservations about making a custom order, thinking to yourself, “Am I going to have to wait six weeks for that?” You may have even had such an experience in the past with other companies. There’s usually extra cost and a long wait for a custom order. That’s the difference our process makes! Every order is a custom order, so we’re quick, and proficient (but thorough) at assembling it. We usually ship to your dealer within 48 hours; there’s no extra charge for customization at Emtek. So, why does this matter to you? You’ll never again have to settle for what you see on display. Mix and match until it’s just the way you envisioned. That’s how we help you Design To Your Taste. You design it. We’ll make it. With no extra charge or waiting. That’s the way we’ve always done it at Emtek, and always will. P.S. Is there are topic you’d like us to explore here? Tell us what you’d like to talk about by sending an email to blog@emtek.com.